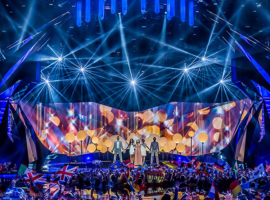 May 2013, Malmö, Sweden – On May 18th, 2013, the final of the 58th Eurovision Song Contest took place and A&O Technology was on board again as a supplier for the biggest international live music contest. 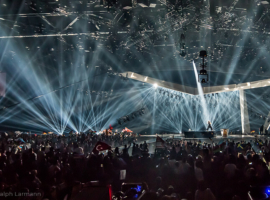 Together with a multitude of FALCON FLOWER and FALCON BEAM 7,000 watts and 3,000 watts xenon floodlights and by the order of the Production Resource Group (PRG) A&O Technology was on location in Malmö where the great final show was going to start. 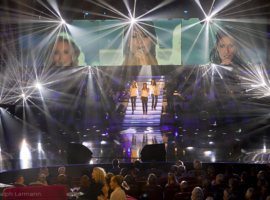 The lighting designers Fredrik Jönsson (LD) and Emma Landare (Associate LD) used the FALCON fixtures for the very special highlights. In addition to the indoor arena several outdoor locations were spectacularly stage-managed by using the light of the FALCON floodlights. By the order of the Swedish company United Audio Starlight AB (Starlight) A&O Technology delivered FALCONs for the outdoor locations. 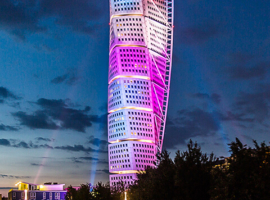 Live Site designer and City of Malmö lighting designer Johan Moritz bestowed the city with Eurovision spirit, including the twisted 190 metres tall building Turning Torso. It was an exciting and impressive song contest which was broadcasted live on TV and also as live stream on eurovision.de! Prior to the grand final on Saturday evening, on May 14th and 16th the half finals had run. This year’s Eurovision Song Contest in Baku, Azerbaijan, generated a great deal of publicity. Not all of it devoted to the subject of immediate relevance: music. Nothing, however, could detract from the splendour of the event itself. 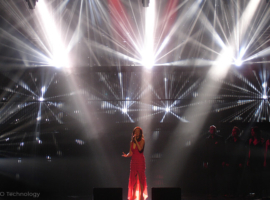 Despite a great deal of heated discussion, the contest went ahead in the ‘Land of Fire’, Azerbaijan, and the high expectations for the show were not only met but exceeded, for the lighting design devised by the German lighting designer Jerry Appelt embraced not only the interior of the Crystal Hall in Baku with its integrated Green Room but at the same time cast the entire 25-metre-high arena in the most flattering light. Alongside, the world’s highest flagpole in the nearby National Flag Square was virtually dwarfed. 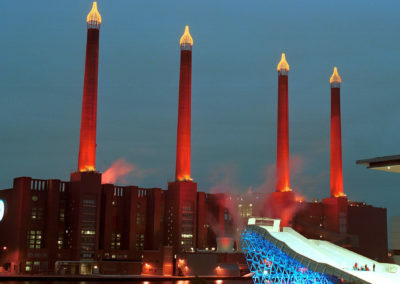 For the multifarious lighting images he created, Jerry Appelt specified inter alia FALCON FLOWER colour 7.000W and FALCON BEAM colour 7.000W luminaires from A&O Technology. 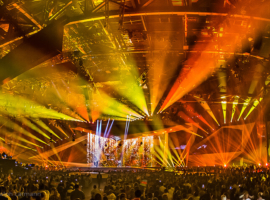 Cape Cross Studio + Filmlicht GmbH, the general technical contractor, had had some seventy FALCON luminaires transported from Germany to the capital of Azerbaijan to provide the two semi-final shows as well as the grand final with their optical highlights. 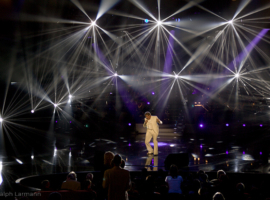 The FALCON FLOWER luminaires were deployed inside the auditorium, where they were installed both above and below the stage, producing magical scenic effects, the impact of titles like Donny Montells “Love is Blind“ (Lithuania) and Loreen’s “Euphoria“ (Sweden) being dramatically enhanced by the raiment of filigree threads and sequins woven and scattered by the lights. Roman Lob (winner of the German casting show “Unser Star für Baku“), representing Germany with the song “Standing Still“, finished in eighth place; but his performance could hardly compete with the mystical, near-solo performance by the ‘wood nymph’ Loreen, whose song “Euphoria”, with its David Guetta-like sounds, struck a chord with viewers throughout Europe. Perhaps the lighting design, which bordered on minimalism but was scarcely the less poignant for that, contributed to this triumph. Her unusual performance was thrown into relief by the play of light and shadow. Seldom can the distinct and filigree beams of the FALCON FLOWER have been used to such magical and impressive effect. Jerry Appelt certainly knows his craft inside out, as well as being exceptionally well versed in the devices of the FALCON range. 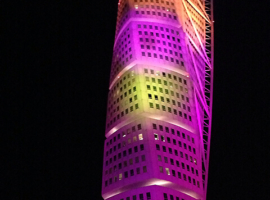 This was already evident from outside the building, for the spectacular light show was by no means confined to the interior. 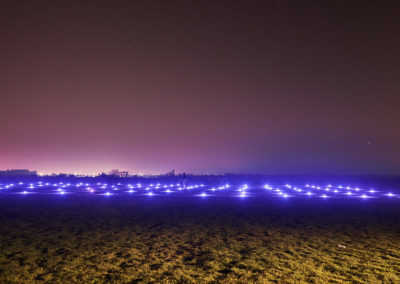 The stage provided by the unique location on the shore of the Caspian Sea was also illuminated and rendered visible for miles around. 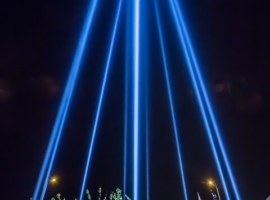 The Baku skyline was the richer on the three evenings the competition lasted for an illumination at once vibrant and informative, as the diamond-like facade of the Crystal Hall, studded with lighting elements, was bathed in the national colours of whichever country’s performers were at that moment on stage. 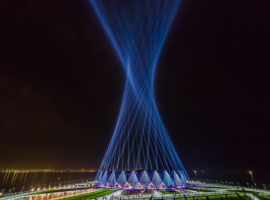 In addition, the hall, which is over 200 metres long and 160 metres wide, was ringed by FALCON BEAM xenon searchlights, for which an elaborate choreography had been programmed in which the beams opened, closed, flickered and created impressive patterns. 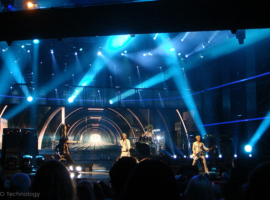 The Eurovision Song Contest is the world’s largest live music competition. 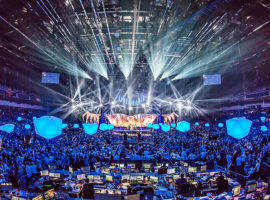 The official production partner of the ESC 2012 was Brainpool TV GmbH. In 2012, forty-two countries participated in the contest, the motto of which was “Light your fire”. 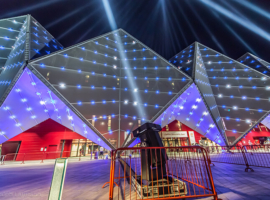 Completed in April, the Crystal Hall in Baku accommodated some 16,000 spectators. 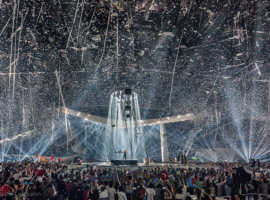 According to Eurovision.de, the live transmission from Baku on German television’s Das Erste (ARD Channel One) drew an average of 8.29 million viewers. 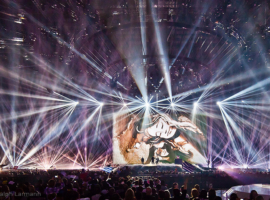 The FALCON® FLOWER made quite an impression at the 56th Eurovision Song Contest recently held at Düsseldorf Arena in Germany. 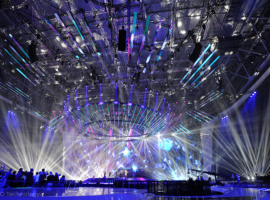 The show is known for making technical leaps and bounds and this year marked the biggest Eurovision in history with regards to lighting equipment and live audience. 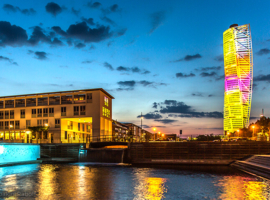 Germany had not hosted the show since 1983 but when Lena Meyer-Landrut won Eurovision 2010 in Norway with her song “Satellite”, Germany was determined to show the world how a show should be done…big. The show’s name says it all. 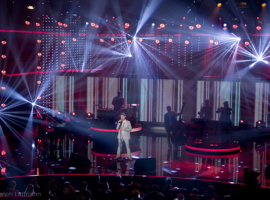 It’s a song contest between member countries of the European Broadcasting Union (EBU). The public votes for their favourite song and the winner hosts the contest the following year. 43 countries competed this year, tying for the most since Serbia 2008. 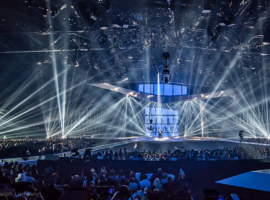 Three live broadcasts were held – two Semi-finals on May 10th and 12th and the Finals on May 14th in front of the largest live viewing audience in Eurovision history with 36,000. 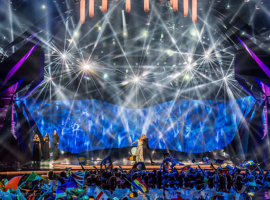 Another 200 million estimated television and internet viewers make Eurovision the largest music television program in the world. 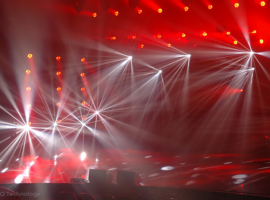 Internationally known German Lighting Designer Jerry Appelt specified masses of lighting to deliver unique looks for the 43 countries, three interval acts and opening act for the Final broadcast. 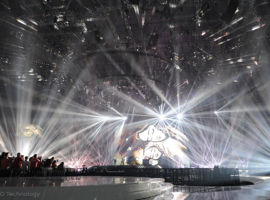 Over 2,100 moving lights were incorporated into the design, with the majority hung overhead, spanning the entire space of Düsseldorf Arena. Clearly, this needed a powerful balance from the floor. 24 FALCON FLOWER 3000W made a massive impact at floor level with 4 placed on each side of the stage at its widest position and another 12 lined along the back LED stage wall. 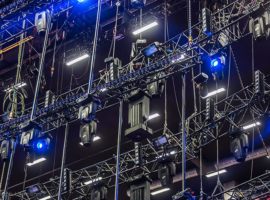 4 more were placed on the catwalks in front of the stage.16 FALCON FLOWER 7000W were placed in the ceiling, with 8 hung on moving truss directly behind the stage. Lighting control was delivered via grandMA2 full-size consoles, triggered via timecode. The FALCON FLOWER is a unique xenon multi-beam effect-light with colour changer, pan-and-tilt movement, electronic and mechanical dimmer, douser, electronic strobe and integrated electronic power supply. 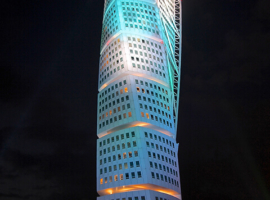 An infinitely variable, rotating reflector produces up to 30 individual beams. 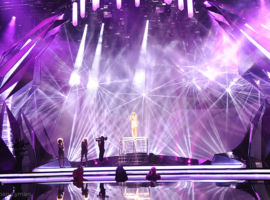 The fixture delivered an exciting punch to many of the songs on Eurovision with multibeam effects in the shape of stars or flowers or just a simple yet powerful beam. 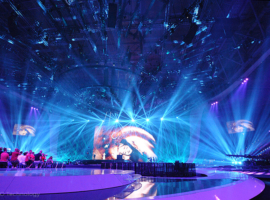 The company behind the creative production of Eurovision 2011 was Brainpool TV GmbH, led by Producer Jörg Grabosch. Brainpool managed all creative aspects including staging, lighting, pyro, hosts, viewing room, technical crew, etc. 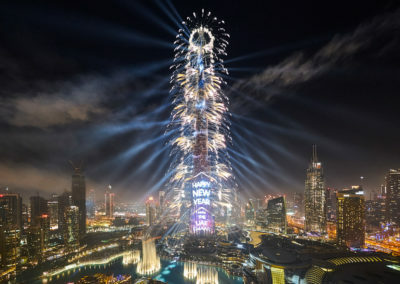 and managed the companies in charge of these areas: Cape Cross (lighting & rigging); Creative Technology (video); Stage Kinetic (moving LED screen); MCI (set construction); and LunatX (pyro). In the end, Azerbaijan was crowned winner with the song “Running Scared”, earning 221 points. Eurovision 2012 will be held in Baku, Azerbaijan.